On 25 June 2013, Metropolitan Hilarion of Volokolamsk, chairman of the Moscow Patriarchate’s Department for External Church Relations (DECR), met with H. E. Wojciech Zajączkowski, Ambassador Extraordinary and Plenipotentiary of the Republic of Poland to the Russian Federation. 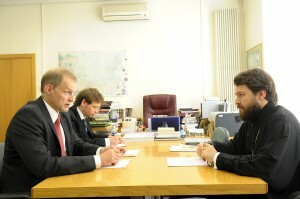 Discussed at the meeting, which took place at the Rudomino All-Russia State Library for Foreign Literature, were plans for a next autumn Russian-Polish conference as a follow-up of the Joint Message to the Peoples of Russia and Poland by His Holiness Patriarch Kirill of Moscow and All Russia and Archbishop Jósef Michalik, President of the Polish Episcopal Conference. The persecution against Christ6ian in the Middle East was discussed. Ambassador Zajączkowski expressed his concern for the abducted bishops of the Orthodox Church of Antioch and the Jacobite Syrian Christian Church. The DECR chairman told the ambassador about actions undertaken by the Russian Orthodox Church for rendering assistance to Christians in the Middle East.